Feb 14th, 2018, New DelhiThe Delhi Government run by Aam Aadmi Party completes three years of governance on Feb 14, 2018, it is time to evaluate its impact on the life of Delhites. 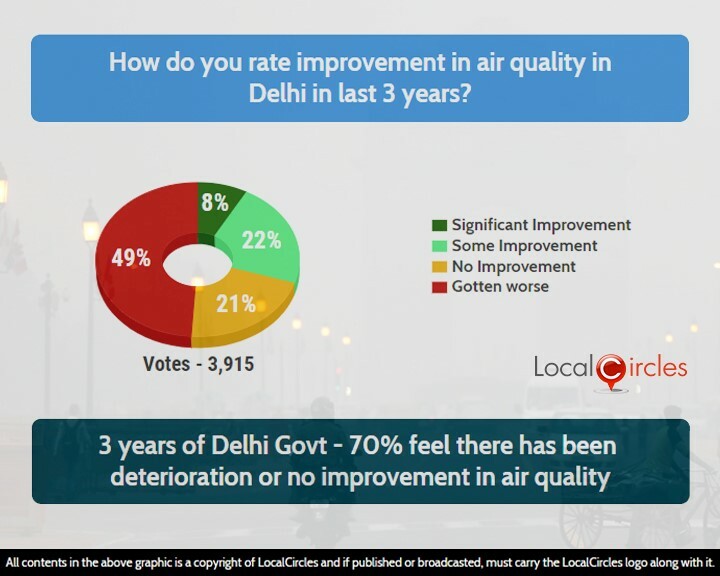 To get measurable performance data points, LocalCircles conducted a 7-point online poll among citizens in Delhi which received over 25,000 total votes. To understand the change comparison with last years’ poll are also given. Overall the results indicate that the Delhi Government has delivered improvements on basic necessities like water supply, power supply, health and school education. The results also indicate deterioration in air quality and limited effort from the Government. On the corruption front, after 3 years people do feel that corruption in areas governed by Delhi Government which exclude law, order, traffic and sanitation has reduced. However, the Government does suffer from the ‘high expectations syndrome’ where only 38% citizens feel that it has met or exceeded expectations. The first 49-day term of the current Government was a great trailer that led to building up of very high expectation. There have been misses too: an effective anti-corruption hotline still does not exist, the city does not have wi-fi system as promised, cases of rapes are still a daily occurrence, public toilets don’t function and garbage heaps are a regular sight across the city. Hence there are still areas of improvement for the next two years. LocalCircles also conducted a similar exercise in Feb 2017 at the completion of 2 years of Delhi Government and the areas of basic necessities like water supply, power supply, health and school education, there has been steady improvement from year 2 to year 3. Pollution or Air quality is one area that has shown deterioration while corruption levels are still them same indicating no progress in the 3rd year. 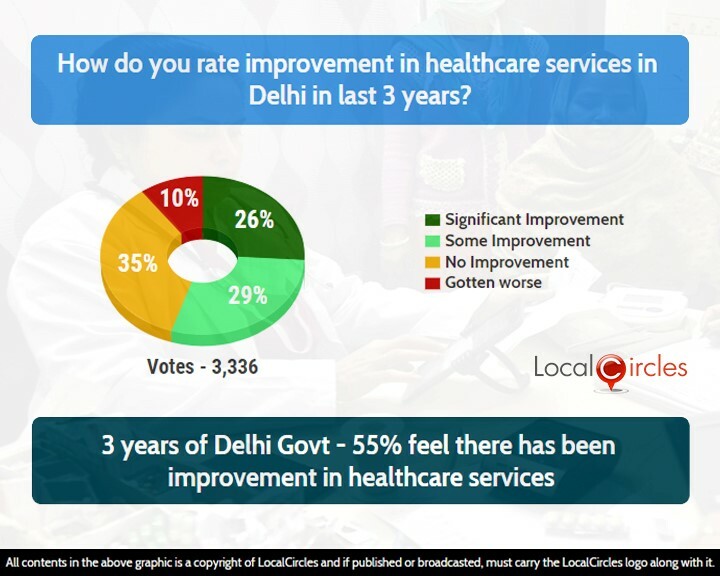 The first question asked how people how they rate the improvement in healthcare services in Delhi in the last 3 years. They were specifically asked to keep availability, affordability and quality as key parameters. 26% said there was significant improvement and 29% said there was some improvement in this area. 35% felt there has been no improvement while 10% felt the situation has gotten worse. Mohalla Clinic project has been liked by citizens and the scheme by Delhi Government where patients coming to Government hospitals can get 13 high-end diagnostic tests free of cost at selected private centres has also been appreciated. Even in Delhi Government hospitals according to citizens, availability of Doctors has improved. However, cases of touts, bribes to Doctors for admission and supplies do continue in these hospitals and something that citizens want action on. Also, many citizens feel that the Government has not been able to restrict poor and unethical practices by private hospitals and pathology labs. The next question asked how citizens of Delhi rated improvement in school education in the last 3 years, keeping key parameters like availability, affordability and quality in mind. 36% felt there was significant improvement and 22% felt there was at least some improvement. 30% said there was no improvement at all and 12% said it had gotten worse. The AAP Government had promised to build 500 schools in Delhi when they came into power but noting substantial has been done on it till date. However, the Government according to citizens has done well on the fee increase issue in private schools and made sure that the yearly fee hike in private schools is under control. They have also doubled the education budget for the state last year and many schools are being upgraded. In addition, citizens feel that the Government has been able to improve accountability of teachers and principals in Government schools. On the EWS front, citizens feel that there are still many gaps as people in collusion with inspection officers are easily able to get classified in EWS category. Cases of people temporarily hiding their assets for EWS inspection regarding school admissions have also been reported. 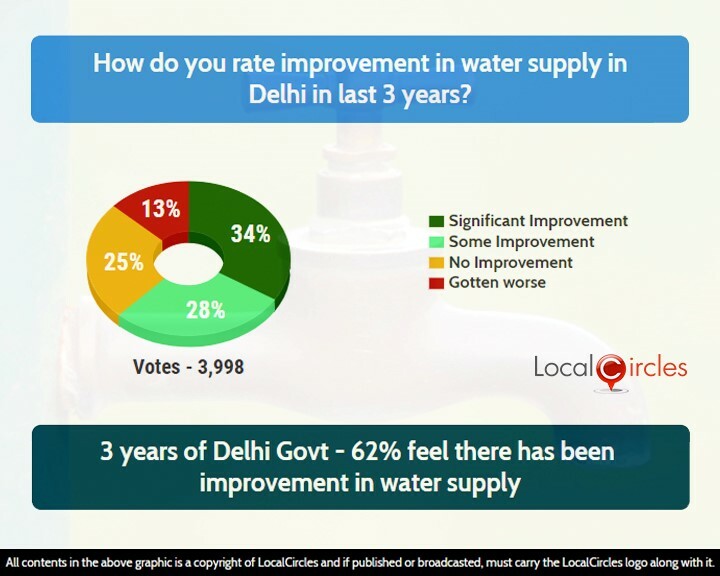 When it came to improvement in water supply in Delhi in the last 3 years, 34% said there was significant improvement and 28% said there was some improvement. 25% said there was no improvement at all while 13% said the situation had worsened. Citizens were asked to consider key parameters as availability, billing accuracy and quality. Lower water bills, availability of piped water as compared to tankers used previously has led to improvement in citizen ratings. However, the recent news of spike in ammonia levels in the waters of in Delhi already has people worried and has led to a water shortage in different part of the city. The Delhi Jal Board is equipped to treat up to 0.9 ppm of ammonia level in water, which currently stands at 2.23 ppm. Power supply has been an area of concern in Delhi for many years with peak summer season seeing long power cuts in different parts of the state. 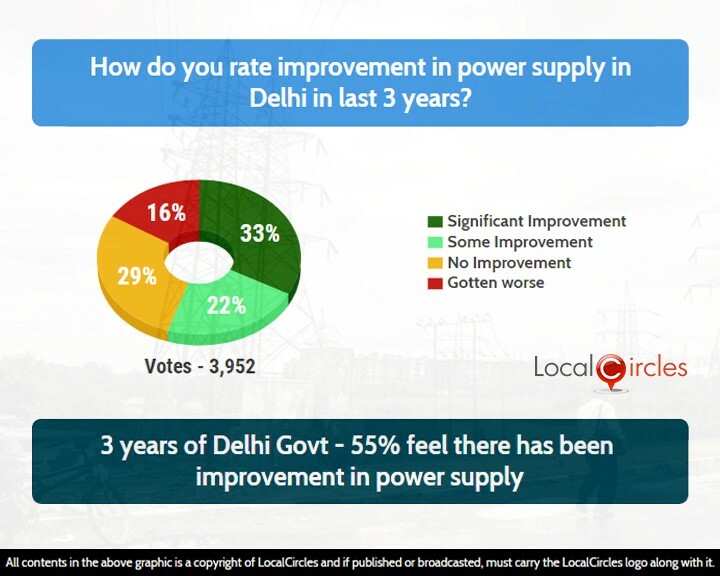 Considering availability and affordability as the key parameters, 33% citizens said that the situation of power supply has significantly improved in Delhi in the last 3 years whereas another 22% said that it had improved a little bit. 29% said there has been no improvement in power supply and 16% said it had gotten worse. Once again, lower power tariffs over a period of time have made people happy. Delhi is constantly in news due to its poor air quality. People in Delhi were asked to rate the improvement in air quality in the last 3 years and 49% citizens said that that it had gotten worse. 21% said there was no improvement, 22% said there was some improvement and only 8% said that there was significant improvement in Delhi’s air quality. Though the Delhi Government blamed the air quality issues on stubble burning in Punjab and Haryana in October, the PM 2.5 in late December was found to be hovering in the 900 range. People feel the Government hasn’t taken any efforts at all after the Odd Even program in 2015. Working with Haryana so the small stretch in KMP highway is completed faster thereby leading to Haryana vehicles not passing through Delhi hasn’t been done. Also, not much progress has been made in implementing mechanized cleaning across Delhi or a zero-tolerance model for garbage burning according to people. Following question asked citizens to rate the state of corruption in the state in the last 3 years. 37% said the reduction in corruption was significant, 22% said it was minor, 33% said there was no reduction and 8% said corruption had increased. Citizens were clearly told that Police and Municipal governance does not come under jurisdiction of Delhi Government and it should not be included in the evaluation for fair assessment. People do feel that Corruption in the last 3 years has reduced in areas of Water Supply, Power Supply, Healthcare, School Education, Transport/RTO, Trade Licenses, etc. However, reports about collusive corruption keep coming up in LocalCircles anti-corruption community where Businesses and Administrators are colluding for tenders, contracts or simply transactional cases where both parties benefit and disclosure is in the interest of none. 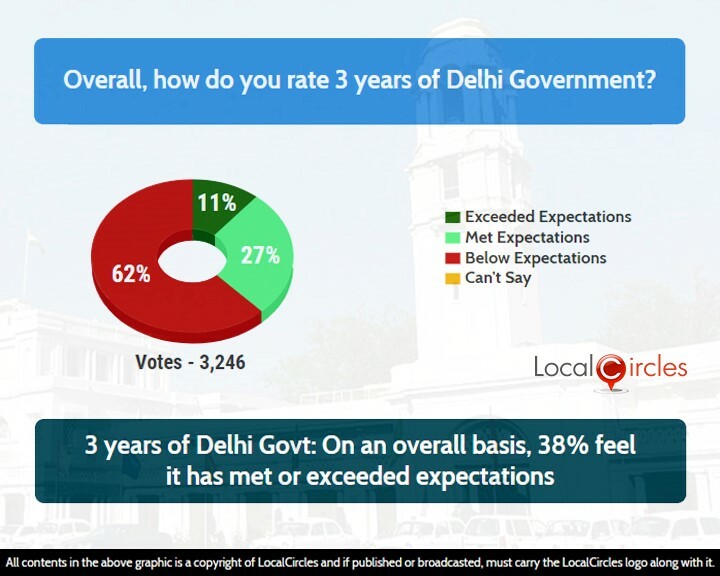 Overall, 62% citizens said that the performance of Delhi Government in the last 3 years has been below expectation. 27% said the performance had met their expectation while 11% said it had exceeded their expectations. This is clearly due to the high expectations that the Government had set during its initial ’49-day’ stint and the big promises it had made to come back into power. Citizens believe that the Government has done some good work in the last 3 years in areas of basic necessities of citizens but would need to raise its standards soon to make Delhi a world class city in every aspect. People also feel that the Delhi Government leaders need to have a more collaborative approach in working with the Central Government and ensure they on their end are doing everything by the book.